Freedom and Flourishing: How close is the link between feeling free and being satisfied with freedom? How close is the link between feeling free and being satisfied with freedom? In my last post I discussed the close association between the feeling of having a great deal of freedom of choice and control over the way one’s life turns out and satisfaction with life as a whole. 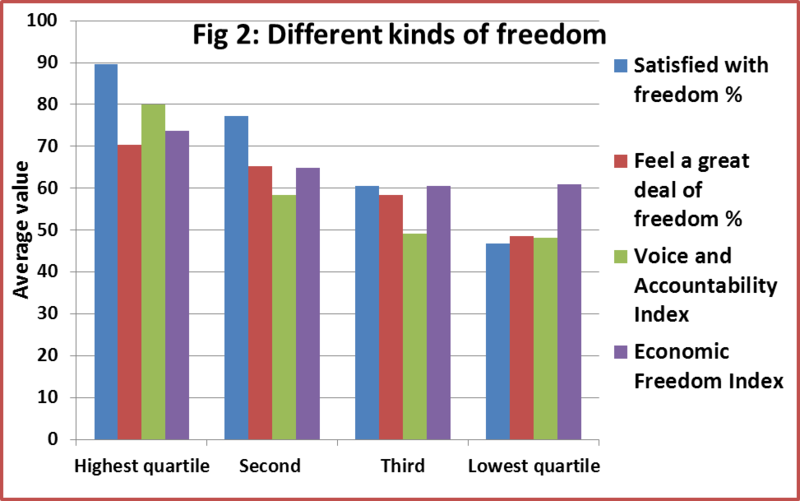 Data from World Values Surveys (WVS) suggests that when people feel they have a great deal of freedom and control they tend to be satisfied with life. 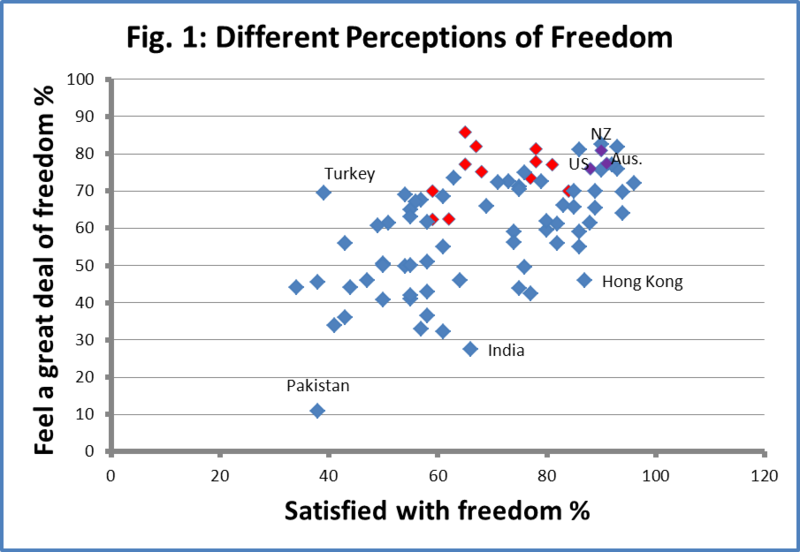 I ended up referring to an earlier post providing evidence that perceptions of freedom are correlated with more objective indicators of freedom. In this post I propose to revisit the links between different indicators of freedom, with a focus particularly on the relationship between feeling free and being satisfied with freedom. The underlying question is whether feelings of freedom of choice and control are influenced by emotional and cultural factors that may not have such a strong influence when people are asked whether they are satisfied with their freedom to choose what they do with their lives. The latter question is asked in the Gallup World Poll (GWP). The observations for Latin American countries in Figure 1 are shown in red. Happiness researchers have previously observed that people in Latin America tend to be more satisfied with life than people with comparable incomes, health etc. in other countries. The location of these observations suggests that this Latin American factor (the secret of happiness?) comes into play to a greater extent when people are asked how much freedom of choice and control they have over the way their lives turn out than when they are asked whether they are satisfied with the amount of freedom in their lives. Perhaps the first question prompts people to look inward at their own feelings while the second question prompts them to look outward and think about national institutions. Figure 2 show a quartile analysis for four different kinds of freedom for the 83 countries, ranked by percentage satisfied with the amount of freedom. Two additional variables, apart from percentage who feel they have a great deal of freedom and control. The first is an index constructed from the World Bank’s ‘Voice and Accountability’ indicator which captures perceptions of the extent to which a country's citizens are able to participate in selecting their government, as well as freedom of expression, freedom of association, and a free media. (The index has been constructed such that an index value of 100 corresponds to an indicator value of +2 and an index value of zero corresponds to an indicator value of -2). The other index is the Heritage Foundation’s economic freedom index, which measures the extent to which individuals are free to work, produce, consume, and invest in any way they please, with that freedom both protected by the state and unconstrained by the state. 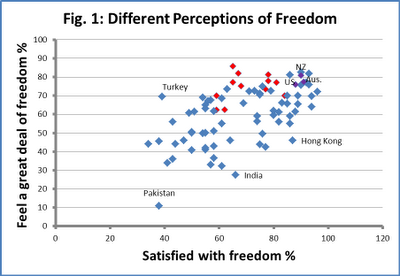 Figure 2 indicates that countries that have high scores in terms of proportion of the population who are satisfied with freedom also tend to have high scores in terms of the other measures of freedom. It is not clear, however, to what extent there is a direct causal relationship between these variables. It is possible, for example, that people could feel a great deal of control over their lives in countries where levels of economic freedom are relatively high because income levels are also relatively high in those countries. High incomes may enable people to feel greater control over their lives.